If Louisiana Governor Bobby Jindal had hoped to seriously counter President Obama on the economic crisis and spell out Republican alternative proposals to deal with it in his nationally televised speech Tuesday night in response to the president's address to a joint session of Congress, he failed on both counts -- badly, observers said. From the blogosphere to the 24-hour cable news channels to the steps of the state Capitol in Baton Rouge, reaction to Jindal's 10-minute address to the country Tuesday night was almost unanimously negative. Critics from both the left and the right said Jindal's delivery was too slow and condescending, and that the content failed to deliver a new vision for a party that has been battered at the polls in two consecutive elections. Jindal's speech, delivered from the governor's mansion in Baton Rouge, was even branded "almost childish" by a panelist on the conservative-leaning Fox News Channel. It was a stunning public-relations debacle for a politician who had enjoyed a relationship with the media almost as charmed as the president's since the 37-year-old Jindal, the Louisiana-born son of immigrants from India, was elected the nation's youngest governor in 2007. In his address, the governor sharply criticized Obama and congressional Democrats on the $789 billion economic stimulus package as "irresponsible" and "larded with wasteful spending.” But he did not attempt to tell viewers how Republicans would have handled the economic crisis differently were they still in charge. Nor did Jindal reveal any new GOP proposals to deal with it. Jindal's criticism was the clearest indication to date that congressional Republicans would continue to resist Obama's economic policies -- despite opinion polls showing broad public approval of Obama's overall performance as president and his handling of the economic crisis. 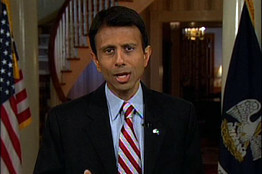 "The way to lead is not to raise taxes and put more money and power in hands of Washington politicians," said Jindal. who gave the Republican Party's official response. The massive economic stimulus bill recently enacted by Obama and congressional Democrats, Jindal said, will expand the government, "increase our taxes down the line, and saddle future generations with debt." Juan Williams, an analyst for the Fox News Channel, gave poor marks for Jindal's speech. “I think he had a really poor performance tonight, I’m sorry to say,” Williams said on a Fox News panel immediately following the governor’s remarks. Williams, who is also an analyst for National Public Radio, went on to call the governor’s remarks “sing-songy” and "simplistic -- almost childish” compared to Obama's. “This was not the best from the young man from Louisiana,” he said. Brit Hume, a recently retired Fox News anchor, was equally blunt. "The speech read a lot better than it sounded," he said. "This was not Bobby Jindal's greatest oratorical moment." But the harshest criticism came from conservative blogger Andrew Sullivan, who called Jindal's remarks "patronizing." Writing in his Daily Dish blog, Sullivan compared Jindal to Kenneth Burns, the nerdy character in the NBC sitcom "30 Rock." "Stylistically, he [Jindal] got better as he went along," Sullivan wrote. "But there was, alas, a slightly high school debate team feel to the beginning . . . And there was a patronizing feel to it as well -- as if he were talking to kindergarteners -- that made Obama's adult approach so much more striking." Sullivan was particularly critical of Jindal bringing up Hurricane Katrina. "I'm not sure that the best example for private enterprise is responding to a natural calamity that even Ron Paul believes is a responsibility for the federal government," he wrote. "And really: does a Republican seriously want to bring up Katrina?" -- a pointed reference to the Bush administration's botched response to the 2005 disaster that irreparably damaged the former president's standing with the public. Not surprisingly, liberal commentators were just as blunt in their criticism of Jindal's performance. In fact, MSNBC's Chris Matthews, host of the cable channel's "Hardball" program, voiced his disdain even before Jindal had opened his mouth. As Jindal entered a corridor leading to the cameras in the governor's mansion -- a sight reminisicent of Obama's walk toward the White House East Room for his first formal news conference on February 9 -- Matthews could be overheard exclaiming, "Oh, God!" Matthews later told Politico.com that he was "taken aback" by Jindal's seeming mimicry of Obama's entrance at his press conference. "Was this some mimicking of a president walking along the state floor to the East Room?" he asked -- referring to persistent rumors of Jindal being a possible candidate for the 2012 GOP presidential nomination, despite his insistence that he has no intention of seeking the White House. But not everyone was critical of Jindal's performance. In fact, right-wing radio talk-show host Rush Limbaugh rushed to Jindal's defense on Wednesday, blasting "the drive-by media" of having "a great disconnect" from his view of the president's address as having "all kinds of lies," while praising Jindal's rebuttal as articulating "what we [conservatives] believe. All he [Jindal] did was articulate opposition to what Obama is doing..."
Limbaugh ripped the governor's conservative critics. "I, sadly, have to include the Fox News All Stars in this," he thundered. "If you think people on our [conservative] side -- I'm talking to you -- those of you who think Jindal was horrible . . . I don't want to hear from you ever again if you think that what Bobby Jindal said was bad or what he said was wrong or not said well!" can be fixed," but added, "Don't throw this guy overboard -- and our side is doing this, and it is a huge mistake. If we're going to start throwing genuine conservatives overboard for some of these specious reasons, we deserve to get our butts beat every election!" Jindal's remarks were the strongest indication to date that the GOP has no intention of backing down from their fierce opposition to Obama's $787 billion economic stimulus package. But in fighting the president over how best to respond to the economic crisis, the Republicans are finding themselves also at odds with the public and running an increasing risk of further alienating the voters. Large majorities of Americans support the stimulus and other plans by the president to revive the economy and strongly approve of his efforts to work across party lines, according to a series of new public opinion polls released in the past few days. Similarly large majorities blame Republicans for the lack of bipartisanship over the economic crisis, the polls found. More than a month into his presidency, an Washington Post/ABC News Poll found 68 percent of Americans approve of Obama's overall job performance, with 64 percent favoring the administration's stimulus package. Another 64 percent majority also support Obama's proposal to stem the epidemic of home foreclosures, although critics complain loudly about responsible homeowners having to "bail out" those who bought their homes knowing they could not afford paying their adjustable-rate mortgages. A New York Times/CBS News Poll released Sunday showed Obama enjoying a 63 percent job approval rating and more than 75 percent of Americans optimistic about the next four years with him as president. The same poll found an overwhelming 75 percent of Americans -- including 61 percent of Republicans -- praising Obama for his efforts to reach across the aisle to Republicans to garner bipartisan support for his economic stimulus plan, while at the same time finding fault with the GOP for spurning the president's efforts. Opinion polls show that many Democrats and independents alike believe the Republicans are making a mistake and ignoring the voters' message sent last November by continuing to resist the need for massive government action to help the economy. But Republican leaders on Capitol Hill are standing firm. "Washington shouldn't be spending money that we don't have," House Republican Whip Eric Cantor of Virginia said in his response to Obama's speech. He pledged that Republicans will work with Obama, but made it clear that they will not betray its "core principles." Senate Republican Leader Mitch McConnell of Kentucky was also conciliatory in his response to the president's address. But he, too, made it clear that "Republicans believe the road back to prosperity is paved with greater personal freedom, not bigger government." While Republicans are shying away from saying publicly that Obama's economic rescue plan will fail -- as Limbaugh is openly advocating on the air -- many Republicans are nonetheless banking on making an electoral comeback in the 2010 midterm elections if the president falters. On the other hand, if the Obama plan succeeds, the GOP will find itself in serious trouble, not only in the midterms, but also in the next presidential election in 2012.